More info:Plus local payment from EUR 580. 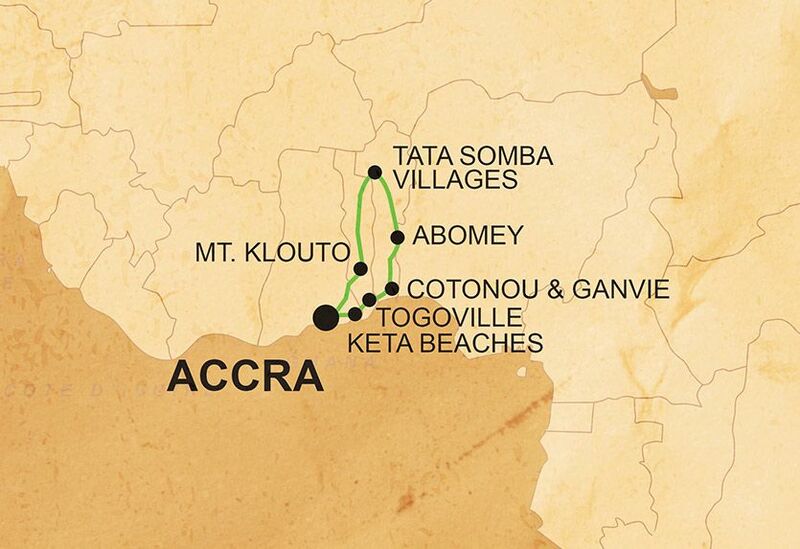 On this epic trip through Ghana, Togo, and Benin, we will be traveling using a combination of overland vehicles and 4x4s, thus cutting out the need for air travel and reducing carbon-emissions. Going overland (by car and on foot for excursions) means you get to experience physically crossing the borders between countries as well as explore places which are off the beaten track. Wherever we are in the world, we prefer to use smaller locally-owned businesses, ensuring that local communities gain a direct economic benefit from our business, for example, we use small locally owned hotels, campsites and activity providers wherever possible. In the Tata Somba region we stay in a small eco-lodge initiative set up by the rural community, which provide local people with tourist revenue and employment, as well as providing a superb opportunity for local interaction. We use local guides and operators throughout the trip; for example, in Abomey we use a responsible local operator that provides training and employment to many local people as guides, providing them with stable employment in the tourism industry. We are committed to promoting human rights within our sphere of influence – this means trying to ensure that everybody involved with us is treated with fairness and respect, including our office staff, crew, local guides and suppliers, as well as all the other stakeholders.